The worst problem confronting the city council is not whether councilmembers are assaulting each other. Instead, said Mayor Karen Majewski at last Tuesday’s emotional council meeting, it’s councilmembers not keeping their word. 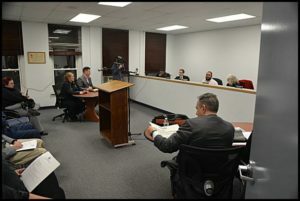 “Our word is the basis our constituents trust and allows us to work together,” Majewski said during a lengthy discussion on a resolution to censure Councilmember Ian Perrotta. The resolution was submitted by Councilmember Saad Almasmari, who said Perrotta assaulted him during a recent closed meeting. Perrotta filed a police report charging Almasmari with assault. Almasmari filed a counter-charge of assault. The resolution also took Perrotta to task for comments he made during a council meeting in 2017. At that time Perrotta talked about designing an educational program for residents on how to properly dispose their household garbage. Some councilmembers took offense over his comments, saying he disparaged the city’s immigrant community. That led to a resolution to censure Perrotta, but it was withdrawn. Perrotta insisted then that he did not intend to demean anyone but did offer an apology. Mayor Majewski said she had earlier talked with Almasmari to withdraw that part of the resolution, saying it was an old issue that had been dealt with and had nothing to do with what happened in the closed-door meeting. Majewski said she thought she had an agreement with Almasmari, and was surprised to see it was not deleted in his resolution. Almasmari did not dispute that they had reached an agreement to take that accusation out of his resolution. Majewski also went line-by-line in the resolution, saying it unfairly characterized Perrotta and implied further bad behavior without any basis or proof. The resolution passed 4-0 with Councilmembers Almasmari, Abu Musa, Anam Miah and Fadel Al-Marsoumi voting in favor. Councilmembers Perrotta and Andrea Karpinski declined to vote on the matter. Majewski also took aim at Perrotta, criticizing him for telling his brother about the physical altercation. Perrotta also pointed out that the only thing he is obligated to keep confidential is the subject of the closed-door meeting, which had to do with a lawsuit. Anything that is said or any activity not related to that topic, he said, is fair game. According to the Open Meetings Act, during a closed meeting public officials can only discuss matters related to that meeting. In other words, if the reason for the meeting is about a specific lawsuit, officials can’t launch into a discussion about upcoming labor negotiations. What apparently stirred up the bad blood in that closed meeting was when City Attorney James Allen said he would not discuss labor issues with Perrotta and Karpinski because he perceives them of being too close to firefighters. How did he arrive at that conclusion? Perrotta said Allen called them out by claiming firefighters drink at the bars they own. Perrotta owns Trixie’s Bar and Karpinski’s family owns the Polish Sea League. Karpinski was not at the closed meeting that the physical assaults allegedly occurred. With Perrotta and Karpinski apparently on the rocks with Allen, Perrotta suggested another attorney from Allen’s law firm take over his duties in dealing with the council. Allen did not comment on that suggestion. The next council meeting is Feb. 12. How can Ian Perrotta suggest another attorney take over Allen’s duties? The City Attorney is hired by the City Manager NOT by Perrotta or any individual councilperson. Also what proof is there that Perrotta and Karpinski have been divulging sensitive information to local firefighters – or what proof for that matter that Allen even stated that he would not discuss labor issues with Perrotta or Karpinski? This article points out why people in the metro area continue to laugh at Hamtramck and its elected officials. The council members continue to act like 5 years olds at a day care center. Every four years voters hope they are electing adults, but every four years that hope goes out the window. It’s time to take a step back and take a good long look at yourselves. Quit the petty bickering and grow up!